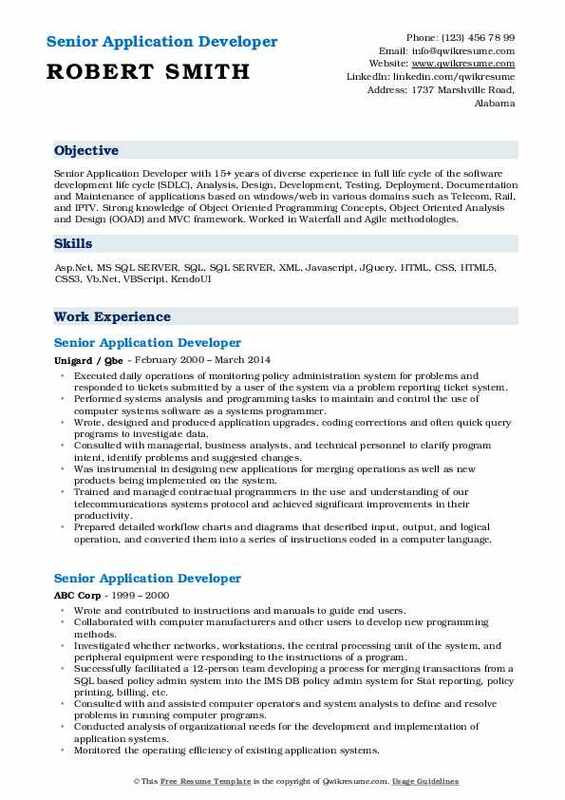 Senior Application Developers take charge of managing the team of software engineers who are related to the creation and updating the programs. The core job description for the senior level application developer includes – creating software for clients, managing all phases from conception to evaluations, supervising application developers, creating new programs, assessing progress of developer team, running and checking tests and program functionalities, testing newly installed programs, writing reports and presenting to upper-level executives, reviewing budgetary issues and negotiating contracts with new clients. 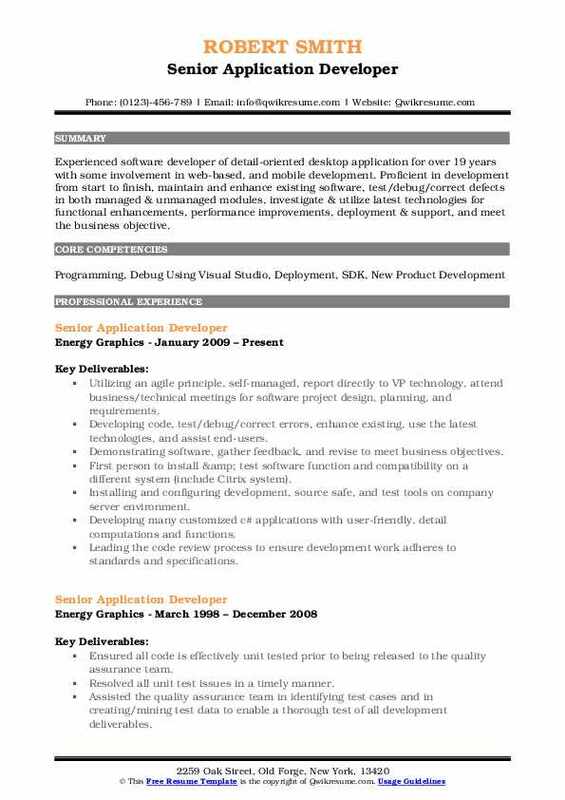 Candidates seeking to make a career as a Senior Application developer should be able to demonstrate skills such as – software development experience, application building expertise, good knowledge of programming language, excellent understanding of programming principles and software designing and time-management skills. 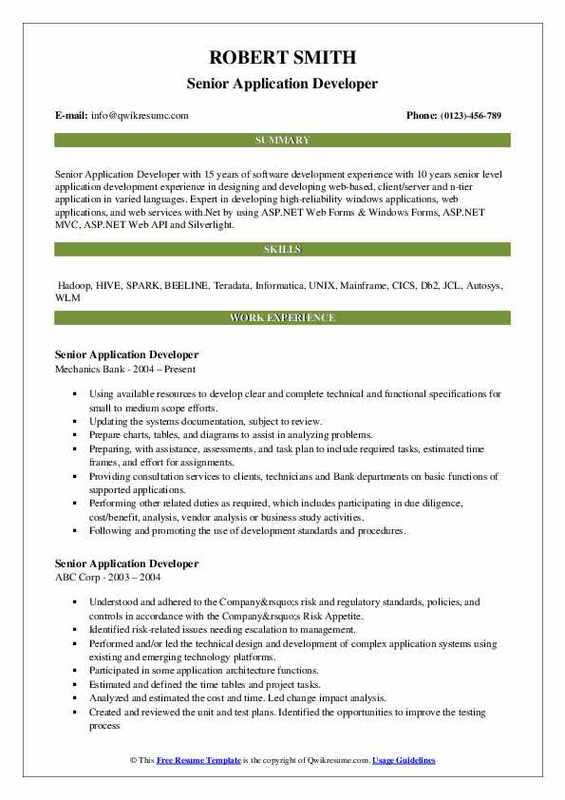 While a degree in the field of software engineering is considered mandatory for this post, showcasing a Masters or a certified application developer in the Senior Application Developer Resume would be well-appreciated. 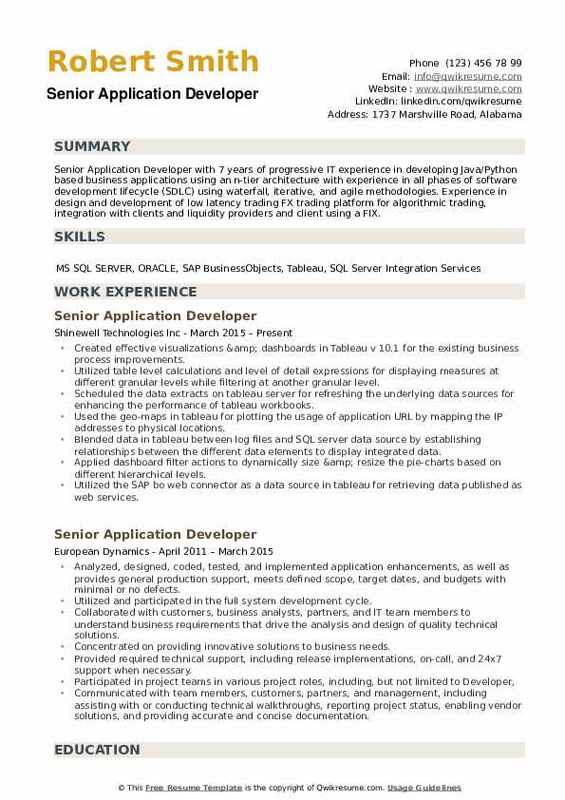 Summary : Senior Application Developer with over 9+ years of experience in implementing SAP for various clients. Strong experience in working with Technical / Development Team; Played key roles in business requirement gathering, design, development coordination, integration testing, Hypercare & Post Go-live support activities. Worked in all forms of projects such as Implementation, Roll-out, Global support and Product development. 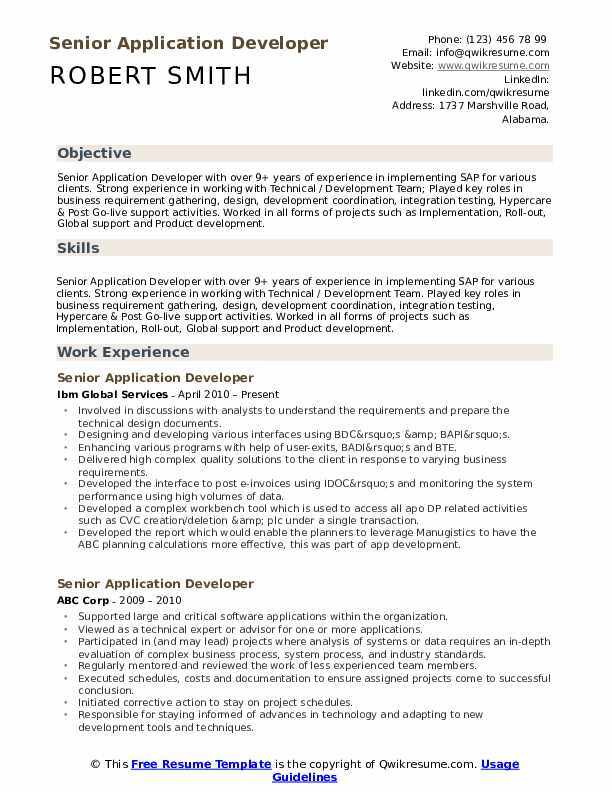 Skills : Senior Application Developer with over 9+ years of experience in implementing SAP for various clients. Strong experience in working with Technical / Development Team. Played key roles in business requirement gathering, design, development coordination, integration testing, Hypercare & Post Go-live support activities. Worked in all forms of projects such as Implementation, Roll-out, Global support and Product development. Involved in discussions with analysts to understand the requirements and prepare the technical design documents. Designing and developing various interfaces using BDC’s & BAPI’s. Enhancing various programs with help of user-exits, BADI’s and BTE. Delivered high complex quality solutions to the client in response to varying business requirements. Developed the interface to post e-invoices using IDOC’s and monitoring the system performance using high volumes of data. Developed a complex workbench tool which is used to access all apo DP related activities such as CVC creation/deletion & plc under a single transaction. Developed the report which would enable the planners to leverage Manugistics to have the ABC planning calculations more effective, this was part of app development. Developed a couple of reports, enhanced badi’s, user-exit’s in the apo related environment. Single point of contact for design, document and development for all apo related objects from a technical perspective. 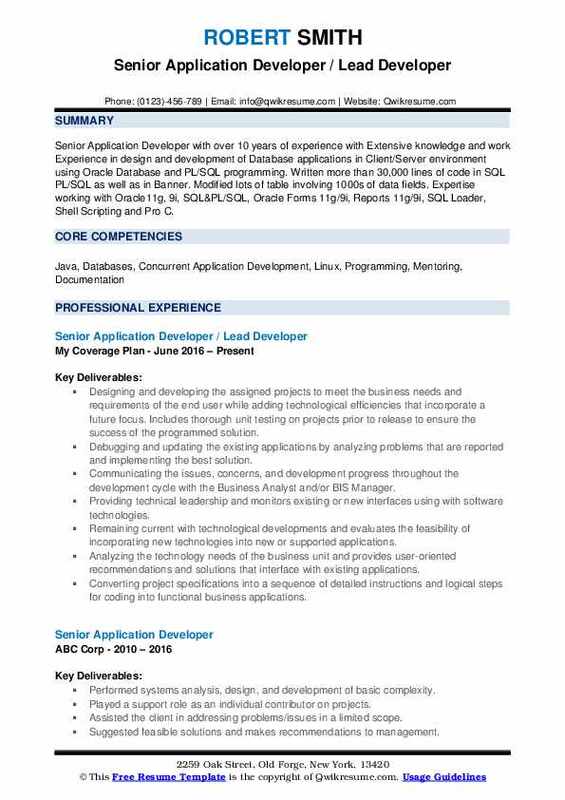 Summary : Senior Application Developer with over 10 years of experience with Extensive knowledge and work Experience in design and development of Database applications in Client/Server environment using Oracle Database and PL/SQL programming. Written more than 30,000 lines of code in SQL PL/SQL as well as in Banner. Modified lots of table involving 1000s of data fields. Expertise working with Oracle11g, 9i, SQL&PL/SQL, Oracle Forms 11g/9i, Reports 11g/9i, SQL Loader, Shell Scripting and Pro C.
Designing and developing the assigned projects to meet the business needs and requirements of the end user while adding technological efficiencies that incorporate a future focus. Includes thorough unit testing on projects prior to release to ensure the success of the programmed solution. Debugging and updating the existing applications by analyzing problems that are reported and implementing the best solution. 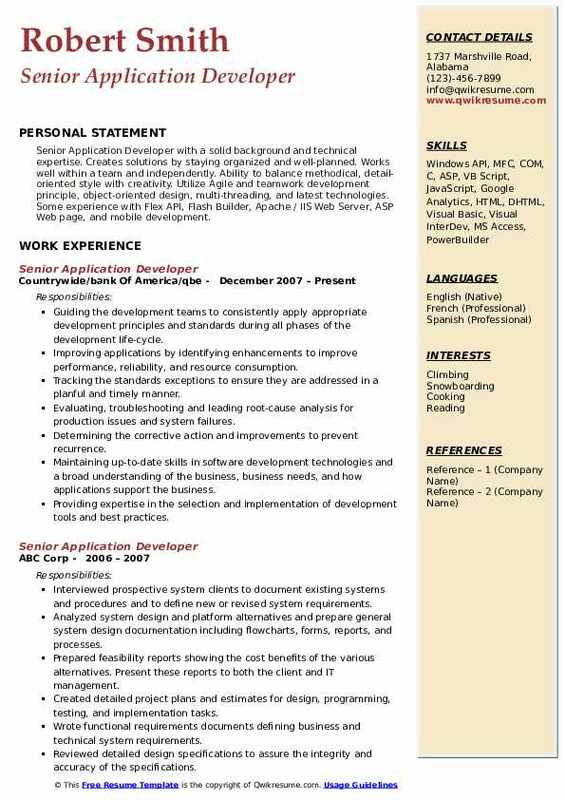 Communicating the issues, concerns, and development progress throughout the development cycle with the Business Analyst and/or BIS Manager. Providing technical leadership and monitors existing or new interfaces using with software technologies. Remaining current with technological developments and evaluates the feasibility of incorporating new technologies into new or supported applications. Analyzing the technology needs of the business unit and provides user-oriented recommendations and solutions that interface with existing applications. Converting project specifications into a sequence of detailed instructions and logical steps for coding into functional business applications. Summary : Senior Application Developer with 15 years of software development experience with 10 years senior level application development experience in designing and developing web-based, client/server and n-tier application in varied languages. Expert in developing high-reliability windows applications, web applications, and web services with.Net by using ASP.NET Web Forms & Windows Forms, ASP.NET MVC, ASP.NET Web API and Silverlight. Using available resources to develop clear and complete technical and functional specifications for small to medium scope efforts. Updating the systems documentation, subject to review. Prepare charts, tables, and diagrams to assist in analyzing problems. Preparing, with assistance, assessments, and task plan to include required tasks, estimated time frames, and effort for assignments. Providing consultation services to clients, technicians and Bank departments on basic functions of supported applications. Performing other related duties as required, which includes participating in due diligence, cost/benefit, analysis, vendor analysis or business study activities. Following and promoting the use of development standards and procedures. Maintaining good working knowledge of the supporting application(s), development environments and the supported client environment. Responsible for lead, analysis, design architect, development, enhancement, maintenance and support of customized. applications, integration to RMS, day to day RMS support and RMS nightly batch on-call support on a rotational basis. Performed impact and GAP analysis to integrate signet dc virtual warehouse into Zales RMS system. Coordinated with business objects team to configure new DC warehouses into ODS and BO environment. Modified invoice receipt and payment interfaces to ap to exclude Akron warehouses. Designed and developed MRT upload, inquiry and transfer resend screens, custom batch processes, and various reports. Developed basic and detailed program specifications. Ensured that expected application performance levels are achieved. Working collaboratively across multiple engineering teams to develop solutions. Working with product owners to write technical specifications and design documents for implementation of new features. Building POS applications using C#, .NET, SQL Server, XAML, and Python. Ensuring that the system improvements are successfully implemented and monitored. Creating working prototypes for new features and requests. Analyzing and modifying the existing code to meet requirements. Performing and/or leading the technical design and development of complex application systems using existing and emerging technology platforms. Participating in some application architecture functions. Estimating and defining the timetables and project tasks, analyzing and estimating the cost and time. 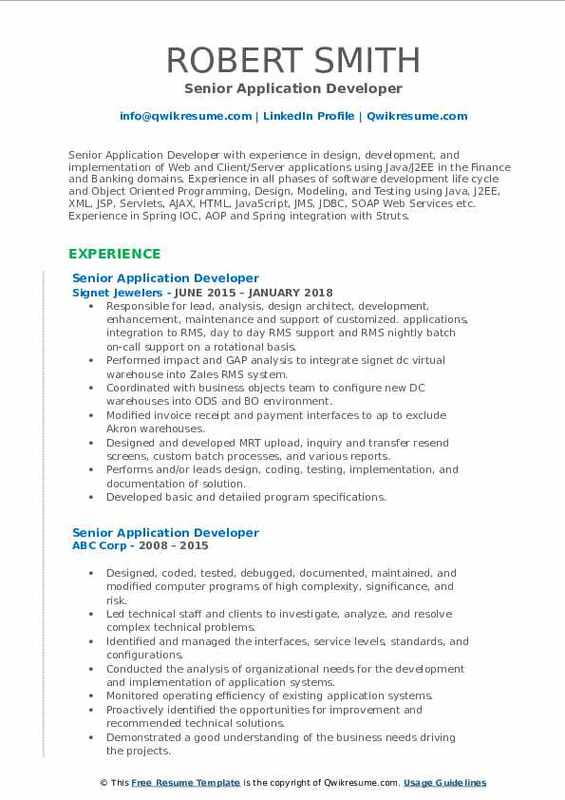 Summary : Senior Application Developer with 15+ years of diverse experience in full life cycle of the software development life cycle (SDLC), Analysis, Design, Development, Testing, Deployment, Documentation and Maintenance of applications based on windows/web in various domains such as Telecom, Rail, and IPTV. Strong knowledge of Object Oriented Programming Concepts, Object Oriented Analysis and Design (OOAD) and MVC framework. Worked in Waterfall and Agile methodologies. Executed daily operations of monitoring policy administration system for problems and responded to tickets submitted by a user of the system via a problem reporting ticket system. Performed systems analysis and programming tasks to maintain and control the use of computer systems software as a systems programmer. Wrote, designed and produced application upgrades, coding corrections and often quick query programs to investigate data. Consulted with managerial, business analysts, and technical personnel to clarify program intent, identify problems and suggested changes. Was instrumental in designing new applications for merging operations as well as new products being implemented on the system. Trained and managed contractual programmers in the use and understanding of our telecommunications systems protocol and achieved significant improvements in their productivity. Prepared detailed workflow charts and diagrams that described input, output, and logical operation, and converted them into a series of instructions coded in a computer language. 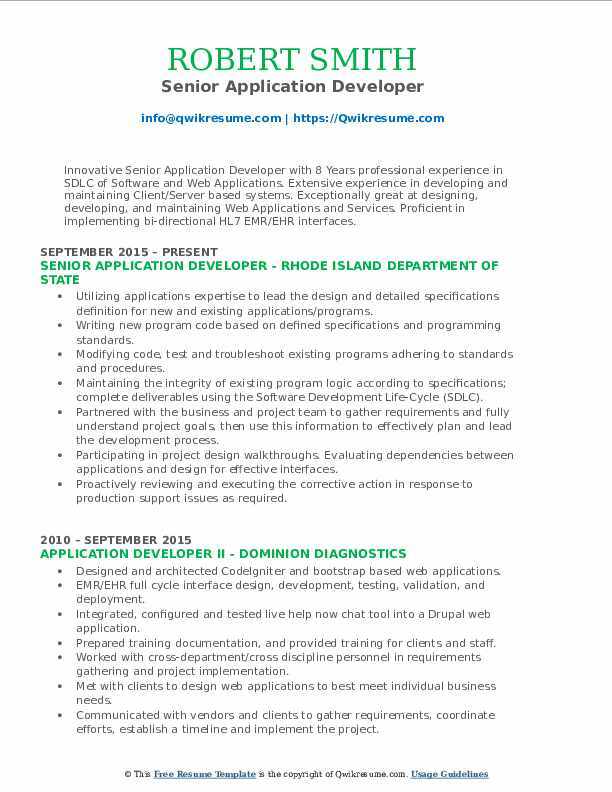 Summary : Innovative Senior Application Developer with 8 Years professional experience in SDLC of Software and Web Applications. Extensive experience in developing and maintaining Client/Server based systems. Exceptionally great at designing, developing, and maintaining Web Applications and Services. Proficient in implementing bi-directional HL7 EMR/EHR interfaces. Utilizing applications expertise to lead the design and detailed specifications definition for new and existing applications/programs. Writing new program code based on defined specifications and programming standards. Modifying code, test and troubleshoot existing programs adhering to standards and procedures. Maintaining the integrity of existing program logic according to specifications; complete deliverables using the Software Development Life-Cycle (SDLC). Partnered with the business and project team to gather requirements and fully understand project goals, then use this information to effectively plan and lead the development process. Participating in project design walkthroughs. Evaluating dependencies between applications and design for effective interfaces. Proactively reviewing and executing the corrective action in response to production support issues as required. Summary : Experienced software developer of detail-oriented desktop application for over 19 years with some involvement in web-based, and mobile development. Proficient in development from start to finish, maintain and enhance existing software, test/debug/correct defects in both managed & unmanaged modules, investigate & utilize latest technologies for functional enhancements, performance improvements, deployment & support, and meet the business objective. Utilizing an agile principle, self-managed, report directly to VP technology, attend business/technical meetings for software project design, planning, and requirements. Developing code, test/debug/correct errors, enhance existing, use the latest technologies, and assist end-users. Demonstrating software, gather feedback, and revise to meet business objectives. First person to install & test software function and compatibility on a different system (include Citrix system). Installing and configuring development, source safe, and test tools on company server environment. Developing many customized c# applications with user-friendly, detail computations and functions. Leading the code review process to ensure development work adheres to standards and specifications. Writing and/or revising system design documentation and operations documentation to include providing required input into operation support manuals and user guides. Creating and properly archiving all project related documentation. Summary : Senior Application Developer with a solid background and technical expertise. Creates solutions by staying organized and well-planned. Works well within a team and independently. Ability to balance methodical, detail-oriented style with creativity. Utilize Agile and teamwork development principle, object-oriented design, multi-threading, and latest technologies. Some experience with Flex API, Flash Builder, Apache / IIS Web Server, ASP Web page, and mobile development. Guiding the development teams to consistently apply appropriate development principles and standards during all phases of the development life-cycle. Improving applications by identifying enhancements to improve performance, reliability, and resource consumption. Tracking the standards exceptions to ensure they are addressed in a planful and timely manner. Evaluating, troubleshooting and leading root-cause analysis for production issues and system failures. Determining the corrective action and improvements to prevent recurrence. Maintaining up-to-date skills in software development technologies and a broad understanding of the business, business needs, and how applications support the business. Providing expertise in the selection and implementation of development tools and best practices. Establishing and maintaining the productive working relationships with business partners and project teams. 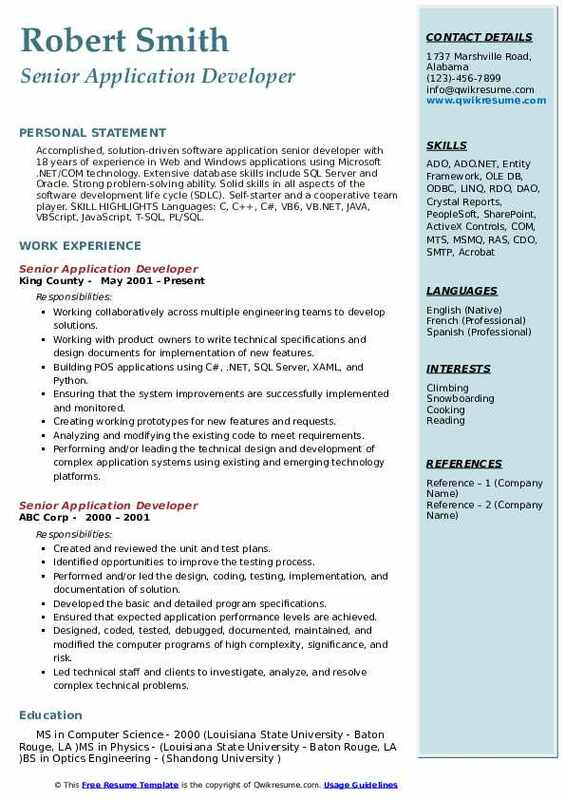 Summary : Senior Application Developer with 7 years of progressive IT experience in developing Java/Python based business applications using an n-tier architecture with experience in all phases of software development lifecycle (SDLC) using waterfall, iterative, and agile methodologies. Experience in design and development of low latency trading FX trading platform for algorithmic trading, integration with clients and liquidity providers and client using a FIX. Created effective visualizations & dashboards in Tableau v 10.1 for the existing business process improvements. Utilized table level calculations and level of detail expressions for displaying measures at different granular levels while filtering at another granular level. Scheduled the data extracts on tableau server for refreshing the underlying data sources for enhancing the performance of tableau workbooks. Used the geo-maps in tableau for plotting the usage of application URL by mapping the IP addresses to physical locations. Blended data in tableau between log files and SQL server data source by establishing relationships between the different data elements to display integrated data. Applied dashboard filter actions to dynamically size & resize the pie-charts based on different hierarchical levels. Utilized the SAP bo web connector as a data source in tableau for retrieving data published as web services. Involved in the dimensional modeling of a data mart for an intranet application.